Flannel shirts made from synthetic fibers are unlikely to shrink much, but most flannel is made from natural fibers, such as cotton or wool. You can shrink flannel shirts made from natural fibers by applying a combination of heat and moisture. Before you begin, check the garment's care label to determine the fiber used. If the flannel shirt is made of cotton, use the iron's cotton setting to shrink it. If the flannel shirt is wool, use the iron's wool setting. Dip the pressing cloth in water, and wring out the excess. Hold the pressing cloth up for about a minute to make sure it's not dripping. If it drips, wring it out again. Preheat the iron, and spread the damp pressing cloth over the shirt. The iron should be ready by the time you get the wrinkles out of the shirt and the pressing cloth spread out. Spread the cloth over one section at a time, such as a sleeve, the collar or one of the body sections. 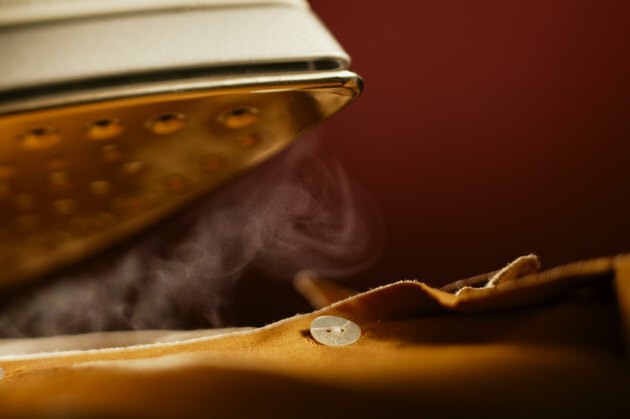 Iron slowly so the heat saturates the fibers and steam rises around the sides of the iron. Use light pressure, and keep the iron moving in a smooth, continuous motion. Do not stop very long in any spot because the iron's heat can scorch the fabric. Wet the pressing cloth when it starts to dry out. Wring out the excess water, and continue steam ironing one section at a time until you have shrunk the entire shirt. If the flannel shirt is cotton, you can also shrink it by washing it in warm water and then drying it on medium heat.